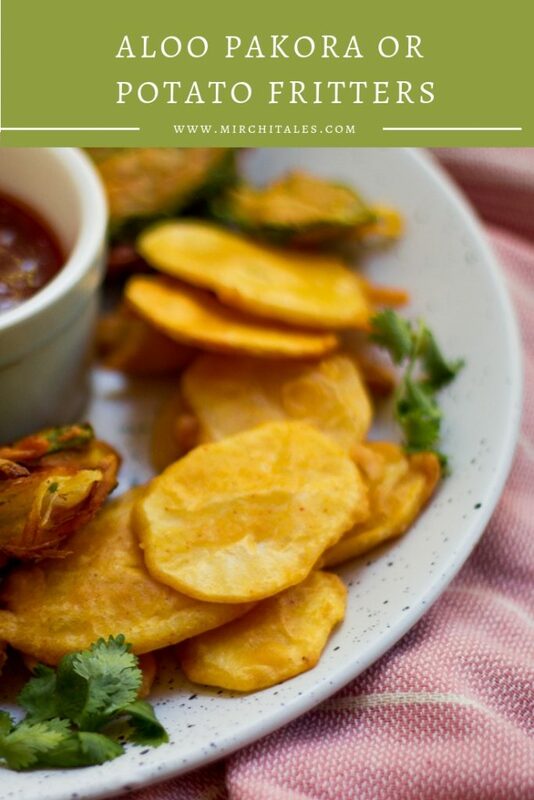 Similar to potato fritters, aloo pakora or aloo pakoda (in Hindi) are a traditional Pakistani / Indian appetizer of sliced potatoes that are coated with a spicy chickpea flour batter and deep-fried till golden brown. 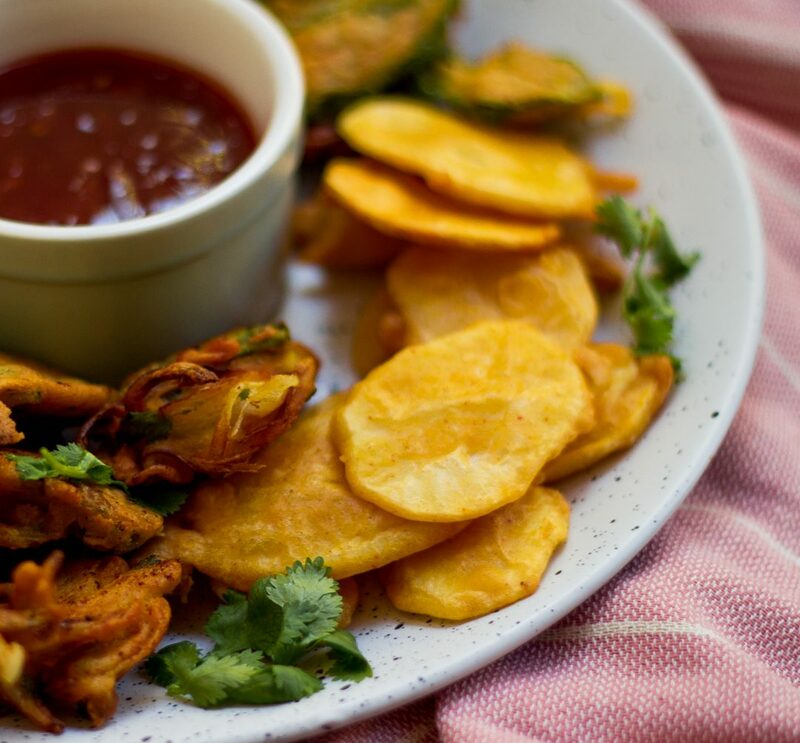 Pakoras are the Pakistani version of a fritter, but made with besan (chickpea flour in English). The traditional ones are the potato pakoras (aloo kay pakoray) and onion pakoras (piyaaz kay pakoray), but chicken pakoras (boti kay pakoray), spinach pakoras (palak kay pakoray), green chili pakoras (hari mirch kay pakoray) are made quite often. 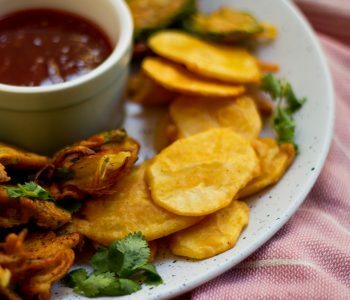 It is a snack that is an essential part of Ramadan at Iftar time, with at least one type of pakora being made for the iftar table. 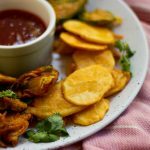 How to make aloo pakora or aloo ka pakoda? Make a batter of chickpea flour / besan with water, season with spices and set aside. Select your potato. It’s good to select one that is thick and large as it is easier to cut. 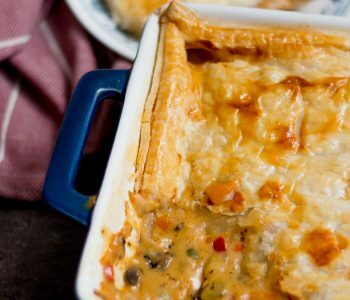 Slice thinly with a knife, dip into the batter and then deep fry. A mandolin can be used but it can slice the potatoes too thinly, and you are looking to cut slices that are not too thick or too thin. Thin enough to quickly cook through in the deep frying, but thick enough to hold it’s shape with the batter coating. Once they are golden brown, take them out and serve them with green chutney or ketchup. Then watch them disappear in seconds. That’s how good they are! Place the besan / chickpea flour in a bowl. Add red chili powder, coriander powder, turmeric powder, salt and coriander seeds or pomegranate seeds if using. 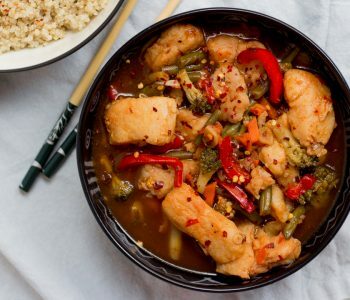 Mix well with a fork. Add water (1/4 cup at a time) to create a batter, and set aside for 30 minutes. Wash and peel the potatoes. Thinly slice them with a knife. You can use a mandolin, but just make sure the potato slices aren’t too thin. They should be thicker than a potato chip, but not too thick otherwise they won’t cook from inside. Dip a sliced potato in the batter to check the batter consistency. It should coat the potatoes completely, but not be too thick otherwise the pakoras will be more batter and less about the potatoes. Heat oil in a karahi, wok or deep frying pan. Dip the sliced potatoes in the batter making sure to coat completely. Add to the hot oil. Cook on low - medium flame till the potatoes are golden brown on the outside (they will fluff up) and cooked through from inside. Use a slotted spoon to remove the pakoras, and drain on kitchen towel to remove excess oil. Garnish with chaat masala, and serve hot with chutney and ketchup on the side. Though you can make the batter a few hours in advance, always cut the potato few minutes before frying because the potato will start darkening as a result of being exposed to the air.